St Anthony of Padua was born to wealth, but for the sake of Christ he became a poor Franciscan priest. A gifted speaker, he attracted crowds everywhere he went, speaking in multiple tongues; legend says that even the fish loved to listen. One of the most beloved of saints, his images and statues are found everywhere. He died in 1231, was canonized in 1232, and on January 16, 1946, he was proclaimed a Doctor of the Church. His memorial day is June 13. St. Anthony is known as a patron of the poor, and the patron saint of seekers of lost articles, travelers, and Portugal. Faith, Hope, Charity, Love of Jesus, Prudence, Justice, Patience, Penance, Humility, Purity, Obedience, Poverty, Spirit of Prayer, and Union with God. on the third, pray the Gloria . On the medal, recite the Miraculous Responsory . See our catalog for available St. Anthony chaplets. Delicate 8mm ovals of vintage glass capture Franciscan browns. The sterling-capped Responsory bead is handmade lampwork, swirling with the same colors. The chaplet is completed with a 1.25" sterling medal depicting the Vision of St. Anthony, when Christ appeared to him as the child Jesus. Franciscan browns are captured by the 8mm faceted rondelles of Botswana Agate. The sterling-capped Responsory bead is handmade lampwork, swirling with the same colors. The chaplet is completed with a sterling medal with St. Anthony on one side, and St. Francis on the obverse. "Behold the Cross of the Lord! Fly Ye Evil Power! The Lion of the Tribe of Juda, The Root of David has Conquered! Alleluia! Alleluia!" "The Lord Bless Thee and Keep Thee, May He Show His Face to Thee and have Pity on Thee, May He Reach His Countenance Toward Thee and Give Thee Peace, The Lord Bless Thee." This chaplet is composed of thirteen sets of three beads each. On the large bead, recite the Miraculous Responsory . The direst need doth quickly flee. Let Paduans say these are of thee. This powerful and highly indulgenced prayer, sometimes known as the si quideris from the first words of the Latin translation, is generally attributed to St Bonaventure, and is considered to have been composed by him on the occasion of the discovery of the incorrupt tongue of St Anthony. This remarkable discovery was made in the year 1263, when the saint’s relics were transferred to the magnificent basilica that had been built in his honor in Padua. When the tomb was opened it was found that the flesh was crumbled in dust but that the tongue was intact and had the appearance of the tongue of a living man. 1. St. Anthony, who raiseth the dead, pray for those Christians now in their agony and for our dear departed. 2. St. Anthony, zealous preacher of the Gospel, fortify us against the errors of the enemies of God, and pray for the Pope and the Church. 4. St. Anthony, who drivest away devils, make us triumph over their snares. 5. 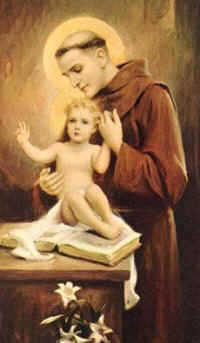 St. Anthony, lily of heavenly purity, purify us from the stains of the soul, and preserve our bodies from all dangers. 7. St. Anthony guide of travellers, bring to safe harbour those who are in danger of perishing, and calm the troubled waves of passion which agitate our souls. 9. St. Anthony, who restorest to young and old the use of their limbs, obtain for us the perfect use of the senses of our body, and the faculties of our soul. 10. St. Anthony finder of lost things, help us to find all that we have lost in the spiritual and in the temporal order. 13. St. Anthony, we thankfully proclaim thy miraculous power, and we beseech thee to protect us all the days of our life. On the Tuesday following the death of St Anthony the people of Padua carried his body to its last resting place in the Church of Our Blessed Lady, which was attached to the Franciscan Friary at Padua. The occasion was marked by great splendour and enthusiasm, and the cortege moved through the city to the music of bells and joyous hymns. The day was marked, too, by an extraordinary number of miracles. The biographers of the Saint tell us that “the blind regained their sight, the deaf their hearing, and the lame the use of their limbs. Every grace and favour asked for in faith and confidence was granted.” The people were so impressed by the wonderful things they had witnessed that they began to observe Tuesdays as days of special devotion in honour of their saint. However, as time went on, the practice fell into disuse until, in 1616, St Anthony himself revived it in the form of a novena of nine consecutive Tuesdays. The grateful parents spread everywhere the news of the miracle and very soon the Devotion of the Nine Tuesdays became very popular throughout Europe. Today it is practiced universally throughout the world. It has always proved to be a marvelously efficacious means of winning St Anthony’s assistance. (i) Receive, if possible, the Sacraments of Penance and Holy Eucharist on nine consecutive Tuesdays. This may be done in any church. (ii) On each of the Tuesdays visit a church, Franciscan if possible, and before a statue or relic of St Anthony, recite appropriate prayers. If the church cannot be visited, the prayers may be said at home before an image of the saint. No particular prayers are prescribed for the Novena, but the following are commonly used. O Jesus my Saviour! Who vouchsafed to appear to St Anthony in the form of an infant, I implore you, through the love you bore to this saint when he dwelt on earth and which you now bear to him in heaven, graciously hear my prayer and assist me in my necessities, who live and reign, world without end. Amen. O glorious St Anthony, safe refuge of all the afflicted and distressed, who have revealed that all who piously invoke you at your altar on nine consecutive Tuesdays shall experience the power of your intercession. Encouraged by your promise, and by the knowledge of the wonderful favours and graces which God bestows on those who piously invoke your intercession, I come to you, O powerful Saint, and with a firm hope I implore your aid, your protection, your counsel, and your blessing. Obtain for me, I beseech you my request. (Pause here and make your request). But if it should be opposed to the Will of God and the welfare of my soul, obtain for me such other graces as shall be conducive to my salvation. Through Christ Our Lord. Amen. Then say one Our Father, Hail Mary and Glory Be, followed by the Responsory. Dear St. Anthony, you are the patron of the poor and the helper of all who seek lost articles. Help me to find the object I have lost so that I will be able to make better use of the time that I will gain for God's greater honor and glory. Grant your gracious aid to all people who seek what they have lost ― especially those who seek to regain God's grace. Amen. Briefly the story of St Anthony’s life is this: He was born in Lisbon, Portugal, in the year 1195. At the age of fifteen he entered the community of the Canons Regular of St Augustine. Two years later he was sent to the convent of the Augustinians in Coimbra. It was there that he met five Franciscans who were destined to become the first martyrs amongst the sons of St Francis of Assisi. They came to the convent one night begging hospitality, and were welcomed by the Canons who were even more kind when they heard that the Friars were on their way to Morocco to preach the Gospel to the Saracens. Anthony listened with rapt attention to the guests, and in his capacity of guest-master, tirelessly ministered to their every need. When they had set out on their journey again, they left behind in the heart of Anthony a great desire to follow them and to give his life to God in the foreign missions. Only five months later the five Friars were martyred and their bodies were brought back to Coimbra. This event decided Anthony and he asked to be allowed to transfer to the Franciscan Order so that he might realize his heroic ambition. This request was granted and a few months later we find him on his way to the Mohammedan Mission of Morocco in quest of souls and martyrdom. However, the hour when he seemed to have reached his goal was the prelude to deep disappointment. No sooner had landed than he was stricken down with fever and there was nothing for him to do but to return home. But God had great works in store for him and gave him, through his superiors, an outlet for his missionary zeal in Italy and France. In 1228 Anthony was sent to Padua – the city which has claimed him as its own and has guarded proudly and affectionately his name and fame. There it was that he spent the last years of his all-too-short life, and there it was that he died on June 13th 1231. Less than a year later, on May 30th 1232, he was solemnly canonized by by Pope Gregory IX, who decreed that his Feast should be celebrated each year on the anniversary of his death. In Latin countries (Portugal, Italy, Spain, France) Saint Anthony is the patron of sailors and fishermen. They place his statue in a little shrine on the ship's mast, pray to him in storms and dangers, and even "scold" him if he does not answer their petitions for help speedily enough. In all Catholic countries Saint Anthony holds a special place in the hearts of women. They turn to him with their problems of love and espousal, happiness in married life, fertility, good and healthy children. This patronage was doubtless occasioned by his great kindness and goodness to all, and by the fact that images show him with the Holy Child held tenderly in his arms. Girls go to his shrines to pray for a husband. They light candles before his image and drink from the fountain in the churchyard (Anthony's Well). In Spain he is called Santo Casamentero (the Holy Matchmaker). The Basque girls make a pilgrimage on his feast day to the town of Durango in Biscaya, where they climb a high mountain and pray there in the shrine "for a good boy." Sometimes their prayers are answered immediately; for the young Basque men have the habit of making the same journey, waiting outside the church and asking the girls to dance after their devotions. Saint Anthony's best-known gift, however, is his power of restoring all manner of lost things. In little matters and great, he is prayed to constantly by millions of people, and like Saint Christopher, is often invoked by non-Catholics as well. There is no particular event in his life, nor any legend, that would explain the origin of this patronage. In fact, many explanations have been attempted, and most of them are quite unsatisfactory. The most logical seems to be the report in an ancient Portuguese book (the event might well be historical) that a man had stolen a valuable volume of chants from a monastery. Some time afterward, when praying to Saint Anthony, he not only felt sorry for the theft but was also inspired with a great urge to return the book. He did so revealing that the Saint had made him restore the "lost" volume; whereupon people began to invoke Saint Anthony on similar occasions when something belonging to them was lost.68 The custom of praying to the Saint for lost articles actually started in Portugal and spread from there to the rest of Europe, whence immigrants brought it with them to America. Tuesday is devoted in a particular way to the veneration of Saint Anthony because he was buried on Tuesday, June 17, 1231. In the seventeenth century the practice began of holding weekly devotions to him; and even today, most "perpetual novenas" to Saint Anthony are held on Tuesdays. Portugal and Italy, where the Saint was born and where he died, honor his feast day with unusual festive splendor and great devotion. In Portugal the epithet "of Padua" is never used, for to the Portuguese he remains "Anthony of Lisbon" or "of Alfama" (the district of Lisbon where he was born). There every house on June 13 displays, among other decorations, a shrine with a statue of the saint. the root of David has conquered, Alleluia!" are words that Pope Sixtus V had inscribed on the obelisk he erected in the quadrangle in front of St. Peter's Basilica in Rome. They are also words attributed to St. Anthony known as the Brief (or letter) of St. Anthony. Some people carry the words with them asking for protection against the devil. The custom of carrying and praying the words comes from the story of a woman in Portugal tempted by the devil and obsessed with thoughts of suicide. As the story is related, she was on her way to drown herself but stopped off at a Franciscan chapel to pray before a statue of St. Anthony. During her prayer she fell asleep and saw St. Anthony, who released her from her disturbed state of mind. When she woke up she found a letter (brief) given to her by St. Anthony with the words quoted above of what we call St. Anthony's brief. It has been written that the original letter was preserved with the crown jewels of Portugal. The practice may also be rooted in a story about Anthony's own struggle with the devil, who was trying to choke him. Anthony, says the early account by a contemporary friar, put the devil to flight by invoking Mary's help and making the Sign of the Cross. La coronilla de San Antonio está formado por 39 cuentas distribuidas en 13 grupos de 3 cuentas. Cada grupo de 3 cuentas se inicia con una invocación y a continuación se reza un padrenuestro en la primera cuenta, un avemaría en la segunda y un gloria en la tercera. Concluidos los 13 grupos de cuentas, se finaliza la coronilla con el rezo del Responsorio. 1ª. San Antonio de Padua, apóstol por la Fe , ruega por nosotros. Padrenuestro, avemaría y gloria. 2ª. San Antonio de Padua, Patriarca por la Esperanza , ruega por nosotros. Padrenuestro, avemaría y gloria. 3ª. San Antonio de Padua, serafín por la Caridad , ruega por nosotros. Padrenuestro, avemaría y gloria. 5ª. San Antonio de Padua, ángel por la Castidad , ruega por nosotros. Padrenuestro, avemaría y gloria. 6ª. San Antonio de Padua, prodigio de Penitencia , ruega por nosotros. Padrenuestro, avemaría y gloria. 7ª. San Antonio de Padua Espejo de Obediencia , ruega por nosotros. Padrenuestro, avemaría y gloria. 8ª. San Antonio de Padua, mártir por la Paciencia , ruega por nosotros. Padrenuestro, avemaría y gloria. 9ª. San Antonio de Padua, querubín por la Oración , ruega por nosotros. Padrenuestro, avemaría y gloria. 10ª. San Antonio de Padua, celador de la Justicia , ruega por nosotros. Padrenuestro, avemaría y gloria. 11ª. San Antonio de Padua, dechado de Templanza , ruega por nosotros. Padrenuestro, avemaría y gloria. 12ª. San Antonio de Padua, perla de Pobreza , ruega por nosotros. Padrenuestro, avemaría y gloria. 13ª. San Antonio de Padua modelo de Constancia , ruega por nosotros. Padrenuestro, avemaría y gloria. Tomando la medalla del Santo en la mano se concluye la coronilla rezando el Responsorio y Oración de San Antonio. O Rosário de Santo Antônio é formado por 39 contas distribuidas em 13 grupos de 3 contas. Cada grupo de 3 contas se inicia com uma invocação e a continuação se reza um Pai-Nosso na primeira conta, uma Ave-Maria na segunda e um glória na terceira. Concluidos os 13 grupos de contas, se finaliza o Rosário com a reza do Responsório. Senhor meu Jesus Cristo...Abri, Senhor meus lábios para bendizer vosso Santo Nome e o de vossa Santíssima Mãe, a bem-aventurada Virgem Maria ao rezar os Treze Pai-Nossos, Ave-Maria e glórias em honra de vosso servo António, cujas virtudes desejo, com vossa graça, copiar na terra, para depois aproveitar de vossa glória no céu. Amém. 1ª. Santo António de Pádua, apóstolo pela fé, rogai por nós. 2ª. Santo António de Pádua, Patriarca pela esperança, rogai por nós. 3ª. Santo António de Pádua, Serafim pela Caridade, rogai por nós. 4ª. Santo António de Pádua, que praticasteis a mansidão e a humildade de Jesus, rogai por nós. 5ª. Santo António de Pádua, anjo pela Castidade, rogai por nós. 6ª. Santo António de Pádua, prodígio de penitência, rogai por nós. 7ª. Santo António de Pádua espelho de obediência, rogai por nós. 8ª. Santo António de Pádua, mártir pela Paciência, rogai por nós. 9ª. Santo António de Pádua, querubim pela Oração, rogai por nós. 10ª. Santo António de Pádua, zelador da justiça, rogai por nós. 11ª. Santo António de Pádua, exemplo de Temperança, rogai por nós. 12ª. Santo António de Pádua, pérola de Pobreza, rogai por nós. 13ª. Santo António de Pádua modelo de Constância, rogai por nós. Se conclui o Rosário rezando o Responsório e Oração de Santo António. para que dignos assim de suas promessas. Fazei, Oh! Senhor, que a intercessão de vosso confessor Santo António , cheia de alegria a vossa Igreja, para que sempre seja protegida com os auxílios espirituais e mereça alcançar as eternas alegrias. Le Chapelet se compose de 39 grains. Un 40ème grain séparé des autres est ajouté après la médaille de Saint Antoine. Après un signe de croix. « Voici qu’est vainqueur le Lion de Juda, descendant de David, Celui qui sait ouvrir le livre mystérieux vu par les prophètes en y brisant les sept sceaux ». On commence le chapelet de Saint Antoine par les trente neuf grains, regroupés en treize groupes de trois grains. Quelques années après sa mort, un 13 juin, fête d’Antoine de Padoue, le Saint aurait offert à une pauvre femme partie pour se jeter à l’eau de désespoir, un billet. « Prends ce billet, il te délivrera ». Sur le parchemin est écrit en latin le verset 5 du chapitre 5 de l’Apocalypse. La femme obtient la grâce qu’elle demandait. Le texte est alors utilisé par des amis et connaissances qui obtiennent également des grâces. Alors, le roi du Portugal, mis au courant, se fait confier le billet. Et voici que la formule circule davantage et que les grâces se multiplient pour peu qu’on l’exprime avec foi. Ayant constaté l’efficacité du "Bref de Saint Antoine", les Franciscains répandent cette dévotion antonienne et recommandent de porter le texte « sur soi et dans son cœur ». L’une des grâces les plus connues et celle qui, pendant l’hiver de 1708, sauvera d’un naufrage inévitable le navire français l’Africaine. L’aumônier du navire écrit le texte du Bref au nom de l’équipage et le jette à l’eau. Aussitôt la mer s’apaise. Sur la médaille de Saint Antoine, on récite une prière en son honneur, on s’adresse à lui et on lui demande de prier pour nous et de nous accorder les grâces souhaitées.